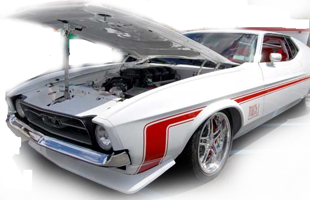 When is the Adirondack Nationals Car Show? 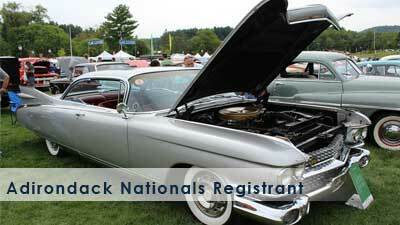 The Adirondack Nationals Car Show is the "Weekend After Labor Day Every Year". 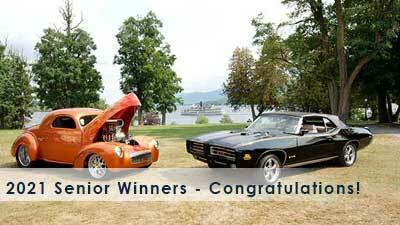 The Adirondack Nationals Car Show is held at the Fort William Henry Resort. From the South: Take the Adirondack Northway (I-87 N) to exit 21. Turn right onto RT-9N and then Left onto RT-9N/US-9 (Canada St.). Travel approximately 1 mile. 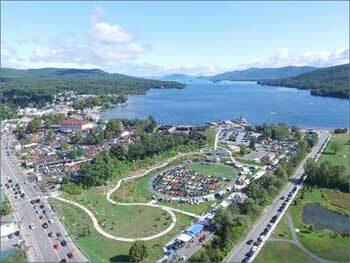 The Fort William Henry Resort is on the right. From the North: Take the Adirondack Northway (I-87 S) to exit 22. Turn left toward US-9. Take the US-9 exit toward Lake George Village. Turn right at US-9. Travel approximately 1 mile. The Fort William Henry Resort is on the left. If it rains, will the show be rescheduled or cancelled? The Adirondack Nationals is held rain or shine and will not be rescheduled or cancelled. The gates open at 7am and close at 5pm both Friday and Saturday. The cruise is from 7pm - 10pm both nights. Spectator admission is $15.00 for the weekend. the hotels that support our event. These are listed on our Lodging page. Other than parking along the streets, we cannot offer any advise. We have tried to get a map of available parking areas from the village but have not gotten anything from them so far. Are the parking meters in the village on or off during the show? The parking meters are on! The village is offering parking passes that will let you park by a meter without having to put money into it. Passes can be purchased in front of the Information Center on the corner of Beach Rd. and Canada St. The price varies depending on the number of days you wish to use the pass. Can I get a pass so I can join the nightly cruise? We do not offer passes to participate in the cruise. We consider it a perk of being a registered participant. stamped envelope! Registration usually sells out in less than two weeks. What year/type of vehicles can enter? Any 1979 and older vehicle can enter the event. I see that registration is closed, does this mean I can't get in? See the question below about Last Chance registration. What is Last Chance registration? A "Last Chance" registration is held on Fort George Road (Lake End) from 9 AM until the grounds are full, on the Saturday of the event to fill any remaining spaces that become available. Visit our registration tent, to put your name on the list. Our registration staff arrives at 7am. Spaces are VERY limited and are determined by the number of Pre-registered cars that do not attend. These spaces are issued on a first come, first serve basis. THERE IS NO GUARANTEE THAT ANY SPACES WILL BECOME AVAILABLE! The forms are available on our web site starting in late november. They can also be found at our Souvenir Trailer during the event. I lost my registration paperwork, what do I do? Have a copy (both sides) of your cancelled check handy and either send us an email or call us at (518) 416-7387 and we will be happy to help you out. I sold my registration to someone else, do I have to let you know? Yes! We need the new registrants name, address, phone, and vehicle. 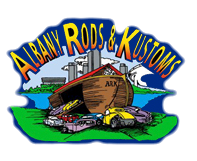 Send an us an email or call us at (518) 380-1874 and we will be happy to help you out. Yes! We use this information during our judging process, so it needs to be up to date. Send us an email or call us at (518) 380-1874 and we will be happy to help you out. for the show. What do I do with my car? FWH guests are asked to park vehicles that are not registered with the show at the Best Western off exit 21 of the Northway (I-87). These vehicles MUST be off of the FWH grounds by 6am on Friday and Saturday morning or risk being towed. The FWH operates a shuttle service, for its guests, to and from the Best Western. Do you have an information booth? Yes, please visit our event trailer near the hotel main entrance for up to date information. Where are the vendors located? We have two vendor areas. Our automobile related vendors are located in the Beach Road parking area just below the Fort William Henry. Our other vendor area is called the Woman's Oasis and is located on the show grounds in the FWH Convention Center, behind Blacksmith Steakhouse. The Woman's Oasis has a wide variety of non-automotive type vendors. It's not just for the ladies! Can I bring my dog into the show? Only "Helper" animals (such as seeing eye dogs) are allowed during show hours. What is the schedule for the outlet store trolleys? The Trolleys run from 10am until 4pm on both Friday and Saturday. They arrive at the stop approximately every 30 minutes. The stop is across the street from the show, near the Adirondack Pub. Look for the large red A-frame sign. When is vehicle check- in? Saturday Check-In - 7am - 9am - Westbrook Rd. After 9am you risk losing your space! Do I need to drive my vehicle through Vehicle Check-In? Yes, We require ALL vehicles that are registered for the show to DRIVE through Vehicle Check-In to receive the event window sticker and goody bag. Can I save a space for a friend who will be here in a little while? No, Due to the volume of vehicles coming through the gates trying to get parked, we cannot hold spaces for people. Please be understanding about this. If you wish to park together, arrive together. Is there any overnight parking? Yes, but only for the guests of the Fort William Henry hotel. These guests must be parked in an actual parking spot on the pavement. If I need to leave early, can you put me close to an exit? On Friday this is not a problem since we allow vehicles to come and go, but on Saturday this is not possible. If you need to leave before the end of the show, your best bet is not to come in. The Awards Ceremony is scheduled to start at 4pm. It will be located on the veranda at the rear of the hotel (by the pool). How do I know if I won an award? If your vehicle is chosen as a winner, we will put a special sticker onto your event registration sticker and place a notification letter either under your windshield wiper or on your front seat if the window is open. I was a winner at the show, am I guaranteed a spot next year? No, we do not hold spots for anyone. Do I get a free registration for next years show? No, winners are not given free registration for the following years event. You must register your vehicle like usual. How do I get my winning car into the souvenir program? We will mail you a letter a few weeks after the show explaining what we need from you to put your vehicle into the Souvenir Program.